I’m backfrom NYC; tired and worn out. As it turns out I pretty much kept my body on Pacific time, which kind of worked out well but I really don’t bounce back from a late night quite like I used to. Anyway, it was a great time (like it always is). I didn’t end up doing much dad-related stuff (I did visit buy buy Baby which I think I’ll write about it later this week) but I did walk around a lot. Besides noticing every baby that went by (an unexpected result of being a new dad without his family), I was also keeping a mental note of stroller activity. 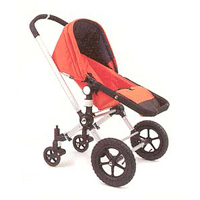 It seems by far the most popular stroller on NYC sidewalks is the Maclaren. I couldn’t say which was the most popular, but there were lots of them. More interesting for me were the Bugaboo Frogs, which was cool because I’ve never seen one in my city (other than my own). Here’s the breakdown. First Bugaboo sighting: about 5 minutes after arriving in Manhattan. Favorite color: I’ve got a red one, but the orange looked pretty dope. Best Bugaboo accessory: The bag clip, which I never wanted, but they actually look kind of useful. Favorite Bugaboo modification: None. Hey, where are the Bugaboo mods? Aren’t dads supposed to be handy? Don’t dads like cup holders? I’m waiting for an inspired dad to make a cup holder for their Bugaboo, and then let me know how he did it.